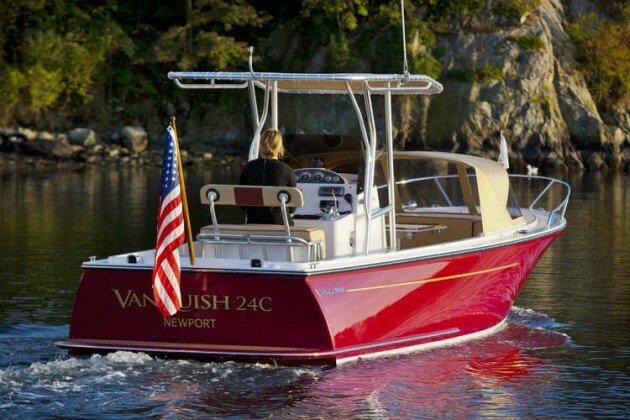 Few boats have the panache and style of the Vanquish 24 CC – if you like to arrive with elegance, check this one out. 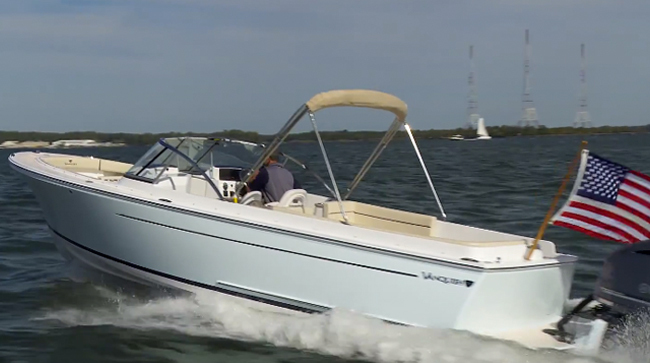 The standard center console fishing boat is a utilitarian craft designed for a specific purpose, but in many ways, that’s a shame. Center console designs aren’t just good for fishing; they’re also excellent for day-trips, watersports, and family use. And there are a few builders out there who have recognized this layout’s functionality, and applied it to boats that don’t have a lot to do with chum, hooks, and the catch of the day. Vanquish is one such builder. Take a gander at the Vanquish 24 CC. Would you tarnish this beauty with chum and fish blood? Perish the thought! Sure, you could bait up and cast from the Vanquish 24 CC. But, why would you? Why risk defacing the buttery fabrics, ArmorFlex gel coat, and two-tone nonskid? 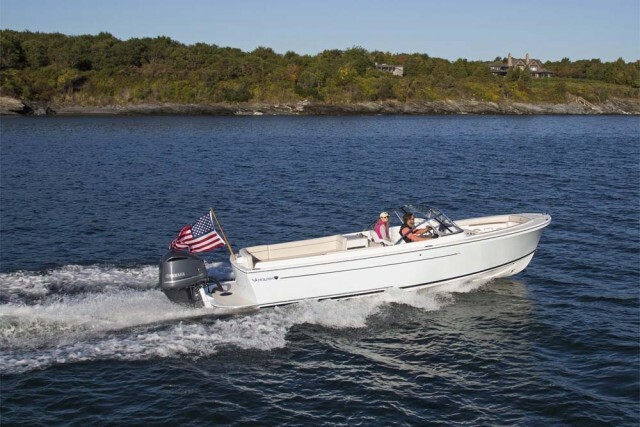 Besides, the accoutrements of dedicated fishing boats, like livewells, fishboxes, and rocket launchers, are replaced with items like aft bench seating, dry stowage compartments, and curvaceous pipework. You can add some fishing features as options—if you’d dare risk sliming the Mona Lisa of center consoles—but my advice would be to leave the poles at home, and bring a picnic basket and a bottle or two of Dom instead. The center console layout, meanwhile, gains you gobs of deck space, and plenty of room for seating. 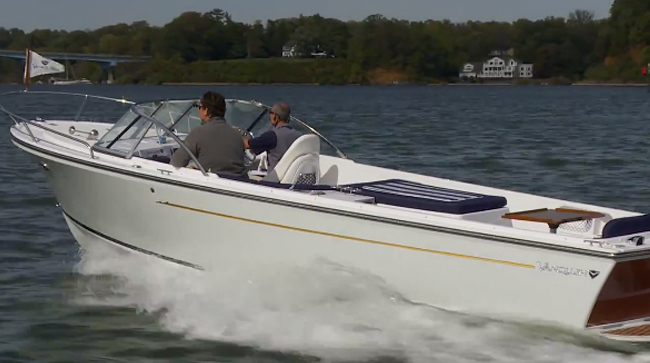 Along with the helm station leaning post and the wide aft bench seat, the bow is lined with comfy seats. A pedestal table sits in the middle, or can be removed for more open space. And the entire bow area is covered by a slick convertible dodger which provides protection from sun, spray, and rain. 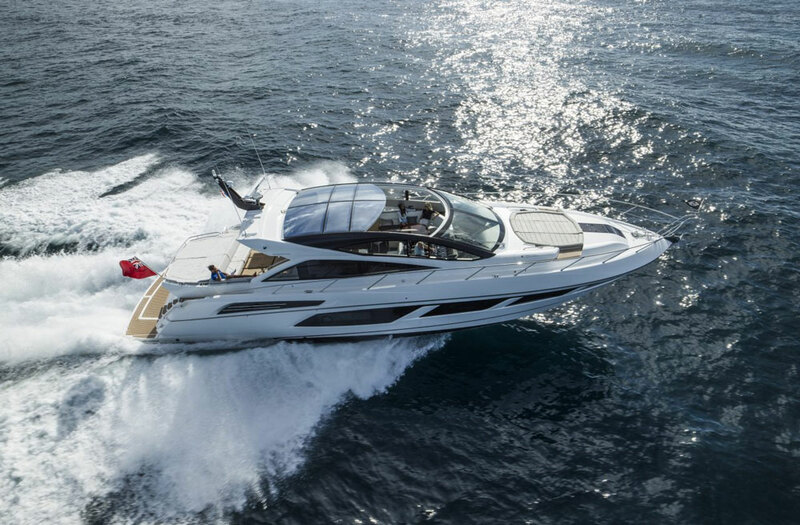 While there’s no mistaking the Vanquish pedigree, don’t let this boat’s appearance fool you into thinking it’s all about the image. 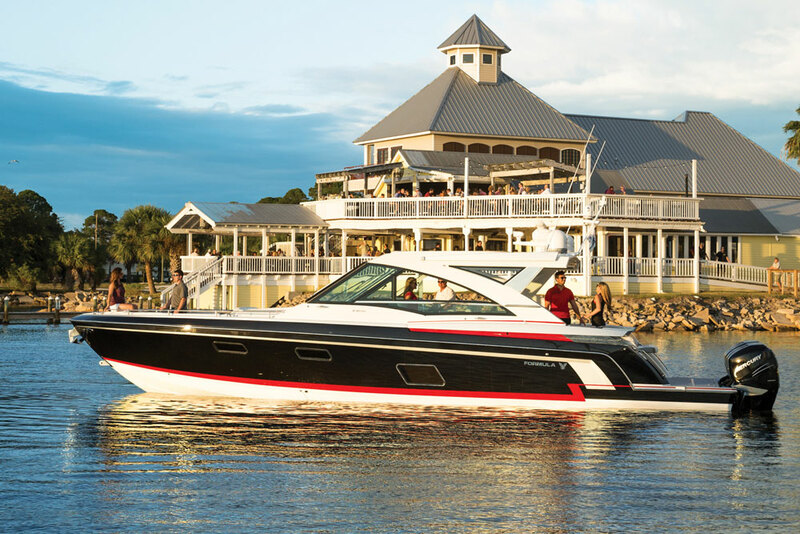 It's built with the most modern, high-tech construction techniques on the water. The stringer system, for example, is built with carbon fiber and vinylester resin. 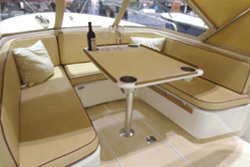 Vacuum bagging and closed-cell foam coring is used extensively throughout the boat. Wiring is all ABYC color-coded tinned-copper. Through-hulls below the waterline are silicone bronze, while those above the waterline are stainless-steel. And the hull to deck joint is a case study in how to do it right, secured with both through-bolts and rubrail screws all the way around and sealed with 3M 5200. You can get a look at it by poking your head into the bow stowage compartment forward of the bow seats, which, by the way, provides a huge bulk stowage area. The bow is clearly tilted towards entertaining, as opposed to casting. There’s one way, however, in which the 24 CC is decidedly un-modern: the power system. This boat is a straight inboard, and these days, there are very few inboards left in this class. Yes, that does mean the boat draws a bit more than an outboard-powered boat of its size, but not a whole lot more, thanks to the substantial prop pocket molded into the hull. And the upside to having an inboard in the belly of the boat is enhanced stability and a lower center of gravity. 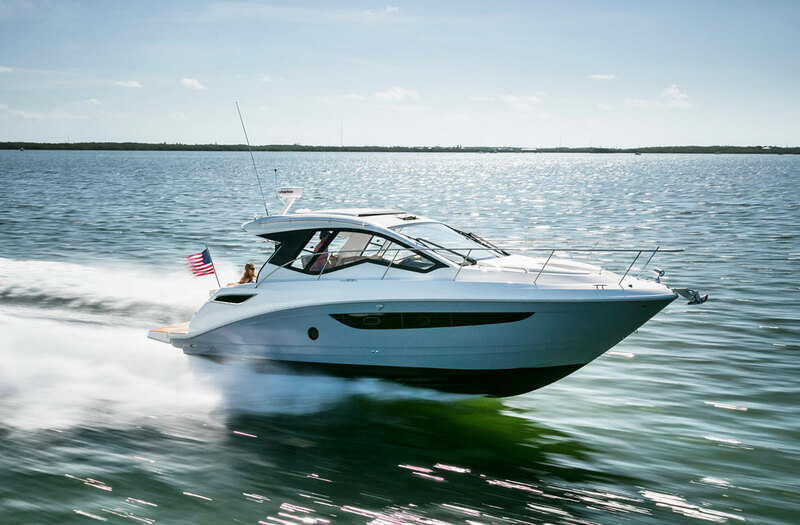 This in turn helps the boat run at a more level angle, allowing for a more moderate transom deadrise—which enhances stability even more—without sacrificing the hull’s wave-splitting ability. In fact, when we darted back and forth across Narragansett Bay's West Passage, I felt the boat took on waves significantly better than most outboard boats of the same size. But naturally, here as always, every choice made in the boat’s design has both upsides and downsides. You do lose the ability to build a head compartment and/or additional stowage into the console (since it houses the powerplant), and some would argue that modern four-stroke outboards offer better reliability and easier maintenance. All of that said, don’t think for a moment that utilizing a straight-shaft inboard means a performance sacrifice. Handling is excellent, period, and surprisingly so for an inboard. Cruising speeds were in the low 30’s, and at top end, we approached 40 MPH. As one might expect, the Vanquish 24 CC is not what you’d call “inexpensive.” You can expect cost to climb over the three figure mark, and even higher when the boat's gussied up. Of course, you get what you pay for. And in this case, you’re getting a whole lot of function, in a very unusual center console form. Other Choices: The Vanquish 24 also comes in a runabout layout. 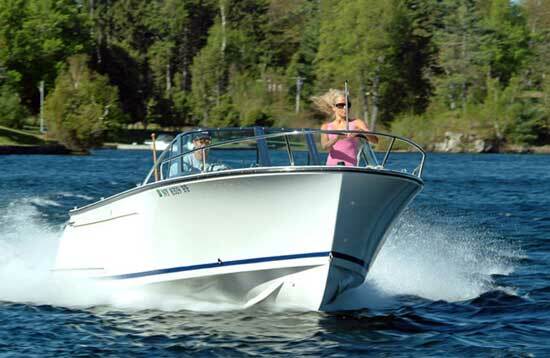 And people interested in this type of boat may also want to look at the Chris-Craft Launch 25 or the Corsair 25. Both, however, are stern-drive boats. For more information, visit Vanquish.